Are you a student with Autism Spectrum Disorder or a related condition? Would you like a peer mentor to help you navigate university life? • Be part of a program specifically designed to support students with Autism Spectrum Disorder or a related condition. • Be paired with a peer mentor who is available to provide support and guidance to help you achieve academic, social and employment goals. • Meet other UWA students with Autism Spectrum Disorder or a related condition at social gatherings. The Program will provide you with individualised attention and support to help you achieve your academic, social and employment goals. 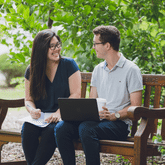 You will be paired with a peer mentor who is a volunteer Psychology honours student. Throughout semester, you’ll meet with your mentor for a couple of hours a week to discuss relevant issues and develop strategies to tackle problems (e.g. time management, wording emails, role playing social situations). The program can assist you with areas including comprehension, planning, organising, forming friendships, group work and oral presentations. Please note the program covers students with conditions including: Autism Spectrum Disorder, Asperger's Syndrome, Pervasive Developmental Disorder - Not Otherwise Specified (PDD-NOS), and Social (Pragmatic) Communication Disorder.